Funny thing about kids...they grow up on you. My daughter is about a month away from turning 10. This past year has seen a lot of changes. She is in that weird space between little kid and teenager. She has a desire to be older - wanting to be included in all conversations, craving independence in all things. But she still has the qualities I love from earlier years ~ playing with her dolls, wanting to be tucked in at night, holding my hand when we are out together. One thing she asked for earlier this year though, was an update to her room. This was her old room. Oh, how I loved that room. 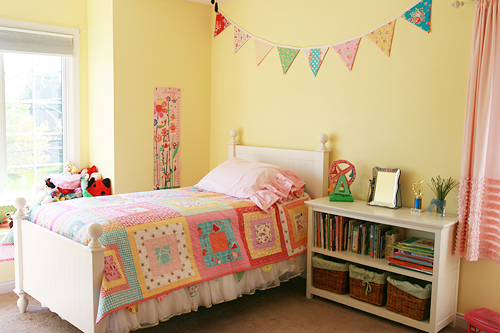 The light yellow, the bunting, the handmade quilt. But I could also see how she felt she had outgrown it. (I believe she was 2 when we decorated it!) Last winter we went to work picking new paint colors and collecting some wall art. Of course she wanted a stripe - new technique to me! The room looked great, but I still owed her a summer quilt for her bed. The colors of her room were inspired by fabric (naturally!). She loved the Paparounes Crimson print from Skopelos by Katarina Roccella. We decided that it would make a great whole cloth quilt. I've never made one before and I'm not sure I realized what I was getting myself into with the seam matching on this fabric. There is a seam down the entire length of the quilt, right in the middle. I'm so proud of how it is matched - you can't even tell! It was a work of patience though. My daughter wanted the quilt to hang quite a bit down the sides of her bed, so I really was pushing the space limits in my house when basting. Quilting on my BERNINA 770QE was no problem though, that large throat space made this quilt very doable on a home machine. I used the dual feed and quilted a 2" grid pattern. This was the same as her previous bed quilt, and it always washed up great and was nice and flexible and cozy. Usually I use Quilter's Dream Request loft batting (lowest loft) but I opted for Select loft this time. It's just slightly heavier - I'm hoping it helps prevent the quilt from falling off her bed all the time. I think it's the perfect finishing touch in her new, updated space.